‘Big’ puppies have very specific nutritional needs, and choosing the best food for large breeds can be both confusing and challenging….. the info. on this page will help! You need to make sure that your pup is getting not just the right nutrients, but the right balance of nutrients… and to do that you will have to take a very close look at the ingredients in any food you’re considering. To find out exactly what you should be looking FOR, hop on over to my my Choosing The Best Puppy Food page (link will open in a new window). You’ll find tons of information about the ingredients and ratios you need to be looking for… and the dog food research that is behind these recommendations. 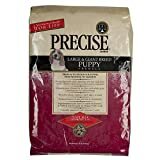 Once you’ve taken a look at that, you can hop right back here and scroll down to find a list of the top puppy food choices for large and giant pups. Next to each choice you’ll find a summary of the individual product and why it deserves a place on this list. Most of these foods aren’t available in grocery stores, and some of them aren’t in pet superstores either. But I’ve included links to Amazon as they can all be bought quickly and easily online, and in some cases shipping is free. There is no one-size-fits-all ‘best’ large breed puppy food because there are all sorts of things to take into consideration (including allergies, general health, breed type and so on). BUT there are several excellent brands and formulas to choose from, and if you stick with a premium product that meets the nutritional requirements of your big pup, you’re off to a flying start. A really excellent range of dog foods from a multi-geneional, family-owned company which has been producing quality pet foods for 30 years. There are 3 different ranges of dog food ….. Precise Original, Precise Plus and Precise Holistic Complete. There are also formulas to suit large breeds, small breeds, seniors and dogs with food sensitivities/allergies (something Rottweilers can suffer from). Their manufacturing plant is USDA/AIB Certified ‘Excellent’, has a first-class safety record and no food recalls. Only contains all natural, human grade ingredients which are naturally preserved. Dry foods are packaged by the company themselves to maintain quality. 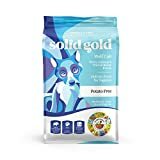 This is an excellent large breed puppy food, with the percentages of protein, fat, calories, and calcium falling close to recommended guidelines for feeding your big pup. Uses premium natural, holistic ingredients, and none of the dangerous additives/chemicals that you need to avoid. The special foil ‘barrier’ packaging keeps the food fresher for longer. Good for puppies with food sensitivities or allergies, and Rottweilers can tend to suffer from these. This puppy food is made with human-grade, all natural ingredients. No by-products or artificial additives. The new, smaller-sized kibble pieces contain deboned chicken, hearty whole grains and a range of nutrient-rich vegetables. Plus a unique ingredient… ‘LifeSource Bits’, which add a beneficial blend of vitamins, minerals and antioxidants that help strengthen your pups immune system. 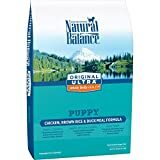 Although this food isn’t specifically designed for large breed puppies alone, it still makes my ‘best puppy food’ shortlist as it’s packed full of high quality, human-grade ingredients. It’s slightly higher in fat than the two foods above, but otherwise it’s a great fit. Made from holistic ingredients. No corn, fillers or artificial ingredients. This large breed puppy food is biologically appropriate food specifically designed for large and giant breed puppies. Made with human-grade protein sources including free range chicken, nest-laid eggs and wild-caught fish. The grains are replaced by highly-digestible fruits and vegetables (low glycemic carbs). *Due to it’s unique formula the percentage of protein is higher than in the other foods above.